Guild Insurance sells professional insurance for employees and business owners. It comes as no surprise that insurance is a low interest topic. Nobody really wants to deal with it, even if we know how important it is to protect our livelihood! Digital advertising data was telling us that it was taking 7 visits to the website before a person would actually move forward with buying insurance. It became clear to us that putting together an advertising plan with a frequency of 7+ was going to be highly expensive unless we could find a clever way of tackling the task. So we employed a retargeting strategy working with a partner called AdRoll. Using technology and tracking code, we were able to track when a potential customer arrived at Guild’s website and left without making a purchase for insurance. We could then follow this individual as they surfed around the web for the following 30 days giving regular reminders to come back and finish their insurance policy and become protected. We created a series of rules that enabled us to show different banner ads to a potential customer pending on where they were in the decision-making process. 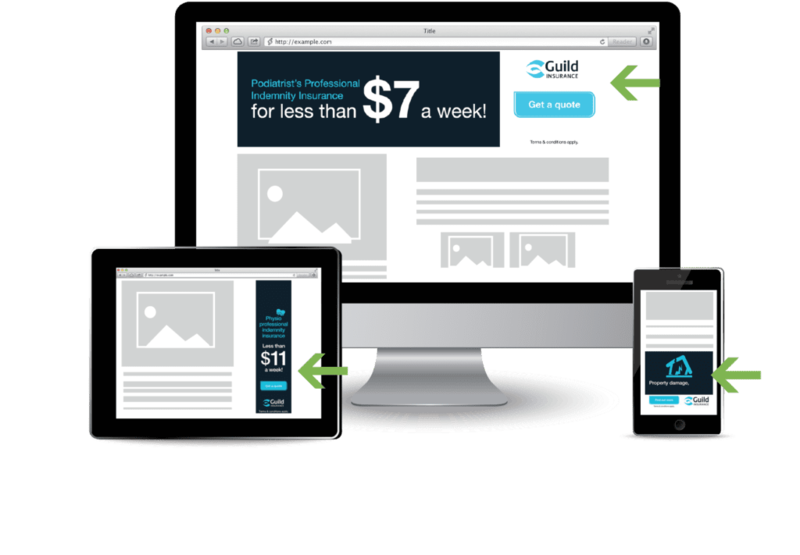 As we continue this retargeting process we will work further to create even more variation of banner ads for each of the 7 times a customer needs to interact with Guild before getting an insurance policy. We found that the cost of retargeting a customer is less than half the price of finding a new customer using media! Retargeting helped us get over 100 customers back to the website and buying policies in 3 months.